I’d like to praise the amateurs out there. The earnest beginners, the ones who dare to create something they’ve never tried before, who risk falling flat, who most certainly fail. This is all of us, at some time or in some area of our lives. At least, I hope so. I guess it is hip to be snarky and removed, to know everything already, to mock the earnest. Let me reveal my age, perhaps, by declaring this: Snark is the language of fear. When I use it myself, I feel a brief charge of satisfaction, then deflation. It hides what’s truest in me. But there’s courage in earnestness—in daring to be a newbie or a total geek. Maybe it’s a gift of midlife (or a gift of the Midwest), but I have come to the conclusion that amateurish enthusiasm is endearing in self and others. I appreciate quality, but I don’t want to stop myself from leaping into the ring by focusing on quality alone. I want to be in the game, not standing on the sidelines. I found a recent local production of Radium Girls to be refreshingly earnest. Community theatre is like that, people putting their hearts into collective art, allowing their neighbors, friends and family to see them in a different light, embodying all kinds of ugly and beautiful things that reflect us back to ourselves to make us think and feel. This was an amateur production, made powerful by the actors’ passion. Other recent examples come to mind. An octogenarian friend printed his own chapbook to share the wisdom he’s gained in 80 years. A folk musician came to my St. Patrick’s Day yoga class and performed ballads he’d written himself. A handful of women gathered for an EmbodieDance experience to move our bodies and express our spirits. Countless others in my circle ply their creativity in poems, paintings, gardens, improv, photography, dance, textiles and more. We may be experts or we may be newbies, and we may be more or less devoted to craft, but we all do our thing imperfectly, humanly. Earnest people inspire me. Especially as I embark on the Tim Clare podcast Couch to 80K, a series of writing exercises in search of the Novel Within. It’s a relief to know that my initial (earnest!) efforts will be “amateurish.” To expect it. See, I’ve stopped thinking of amateur as a bad word. I strive to be professional in my commitment, but I’ll be less lofty, more amateurish, if that means I’m all in—flubs and all. Nature is art. And what’s more earnest than a honeybee? I’d love for that boy to understand that artmaking capacity belongs to everyone. To see this neighbor as artist, and honor her bravery, and take inspiration for his own self-expression. The earnest artist says, This matters, at least to me. This is what I see. This is how I see. And we’re all the richer for it. Walking is a time-honored way to meditate, ruminate, and otherwise seek clarity. Walking a labyrinth gives each footstep even more meaning. And walking in community brings added sweetness to the experience. The Rivoli Park Labyrinth hosted a potluck and group walk, representing the local community on a day when some 200 public events took place across the globe. An intermittent drizzle didn’t keep us from sharing soup and salad while we made new connections and renewed old acquaintanceships. At 1 it was time to drift into the circle of the labyrinth as we each felt ready. I had never participated in a communal labyrinth walk before, and I found it quite lovely to share the labyrinth with others. Each in our own space and yet connected, some chatting, some silent. Sometimes meeting on the path and clasping a hand as we passed each other with a smile. At one point I found myself walking next to an acquaintance who gave off motherly vibes, and I impulsively decided to take her hand until our paths diverged. 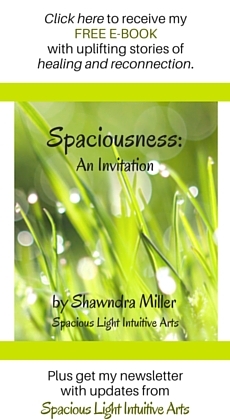 When I enter the sacred space of a labyrinth, I like to set an intention or ask a question. My intention for this particular labyrinth walk: To take nourishment from all quarters. I was feeling depleted after a busy week and several short nights. The meal we shared was one source of sustenance, and I wanted to see if I could also be nourished by the air, the rain, the soil, the plants, and the beings around me, both human and nonhuman—and the movement of walking itself. The boulder in the center is a perfect resting spot. Afterwards, I did feel restored. Walkers can record their thoughts in a log book at the start/end point of the labyrinth. Lisa sees the logbook as a way to encourage reflection and sharing, and to build community among solitary walkers as well. In fact, creative expression is built into the design of the labyrinth itself. In keeping with the art theme, Lisa invited the “Seeds of Common Sound” music bus to take part. 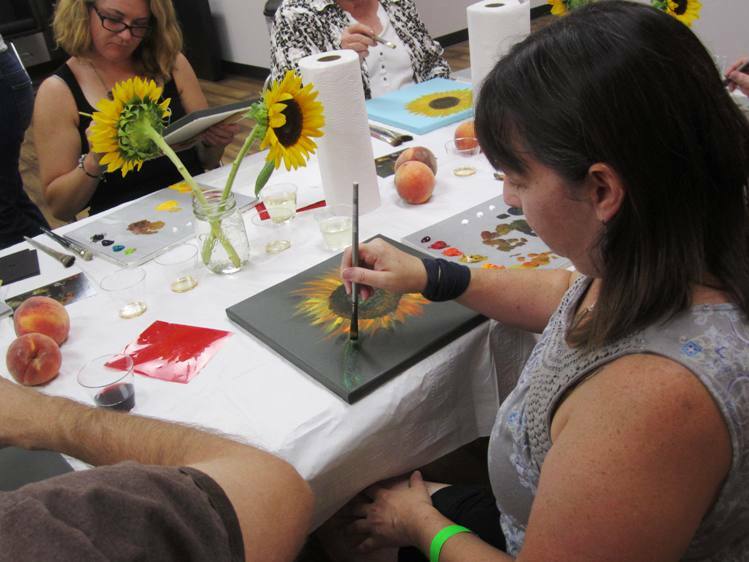 On board the bus, we could add to communal art pieces, play instruments, and get inspired. Care for creatures is another role of this labyrinth, as it was just designated a certified wildlife habitat. Here is our little group with the plaque. I plan to visit Rivoli Park often over the growing season to watch the plant, animal, and insect life flourish there. And to seek nourishment for my soul in this place of quiet reflection. 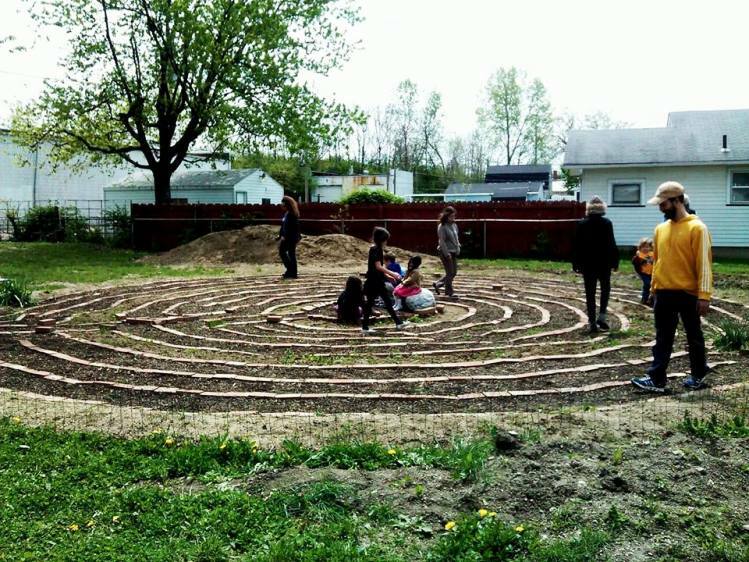 Lisa Boyles, who turned a vacant lot into a beautiful meditation space and labyrinth, is coordinating a new project in her neighborhood. Her energy and drive are truly inspiring. In fact, when I read that she spent part of her birthday volunteering, it moved me to spend part of my birthday helping with her latest project. Check out what she’s up to in today’s guest post. Imagine people of all ages working together to improve their neighborhood. Think of a city unified through installations of art painted by community members. By designing a series of geometric projects, Andrew Severns has a vision for public art in the city of Indianapolis that can accomplish these things. Artist Andrew Severns outlines the design for the mural at E 10th and N Sherman Dr. 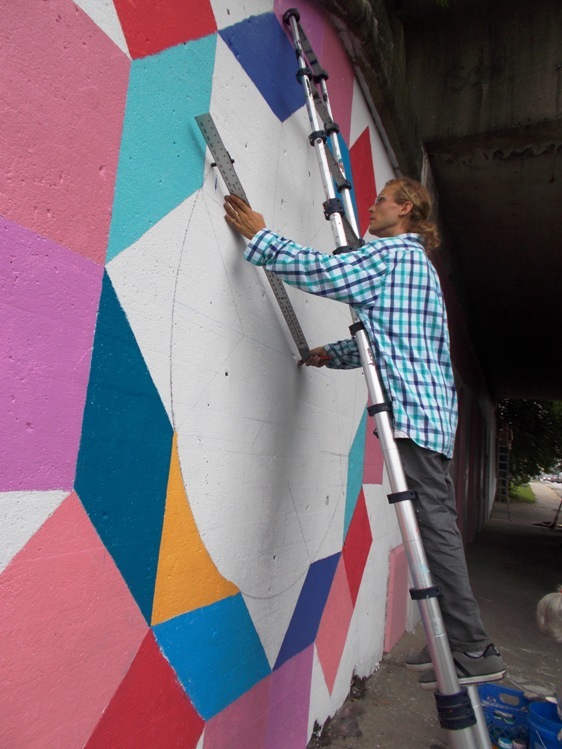 He says that the geometric uniformity among murals and other pieces of art will ensure its strength and timelessness while giving a well-defined look to the city at large. And through the outlines of shapes that Severns provides, those who help paint have a guide for creating a beautiful piece of art. 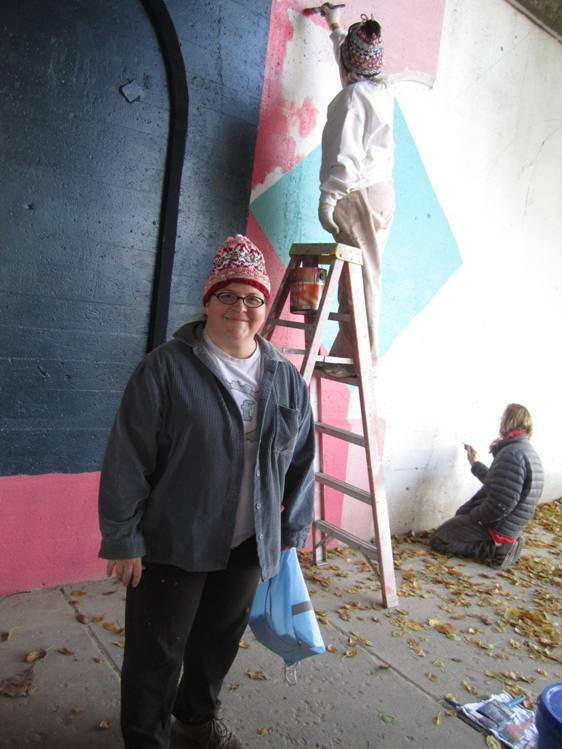 The project at the corner of East 10th Street and North Sherman Drive is part of a larger series along the railroad underpasses in the Rivoli Park Neighborhood. The areas where these projects are planned need care and attention. By creating art that is participatory, people in the community can feel a sense of ownership of these previously neglected corridors. Many hands came together to beautify this street corner, all coordinated by Lisa Boyles (foreground). The geometric style that Andrew uses reminds me of the colored pieces in a kaleidoscope. These shapes interconnect to make a pattern representative of the many different people in our neighborhood living together. It has been terrific to see so many people coming together to paint the mural at this busy intersection—and to hear the honks of approval and positive comments of people driving by. 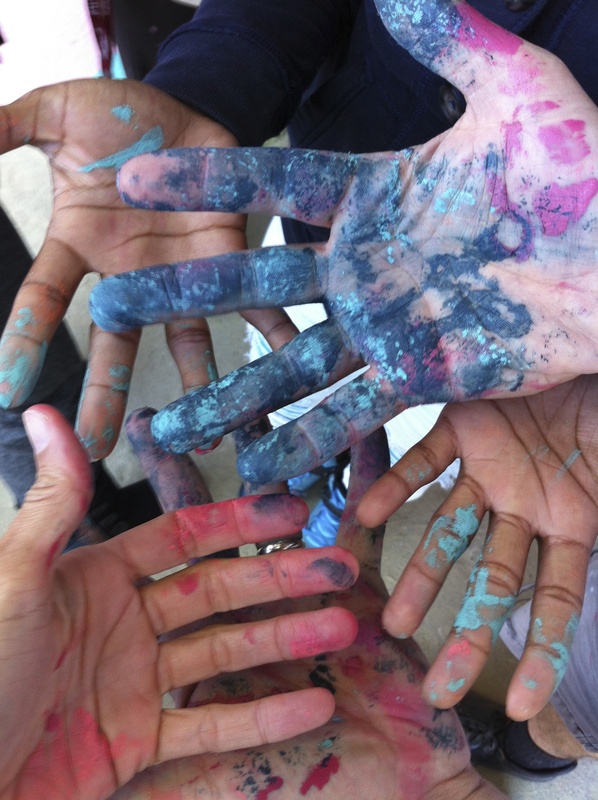 The community’s handprints are all over this site! Students, teachers and parents from the Paramount School of Excellence participated in this mural project. The students seem especially excited to be a part of something positive that will have a lasting impact in their neighborhood. Students from Paramount School of Excellence helped paint this mural. Everyone who has donated or volunteered will have his or her name (or a dedication) alongside the edge of a section of the mural. When people think of their dedication, they are encouraged to also think of a meditation or intention to be a part of creating a better community. We will all share our thoughts about the project at a celebration party at the culmination of the first phase of the project on November 22nd. 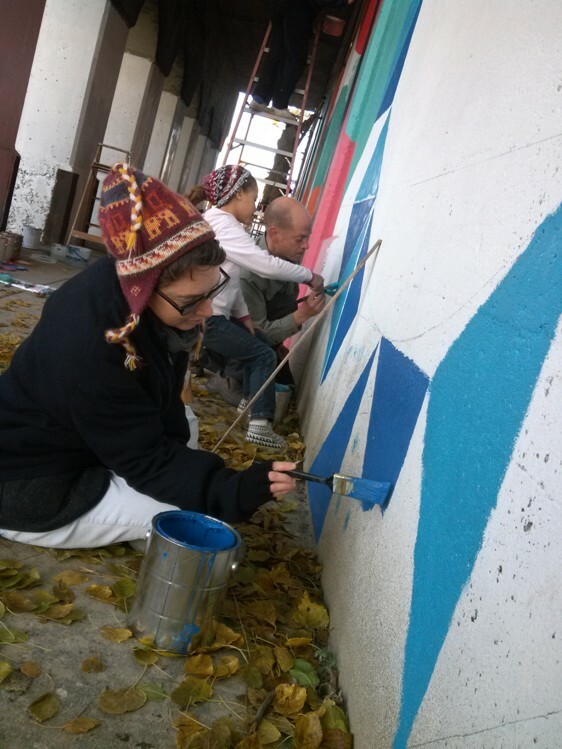 Community members of all ages have come together to paint the shapes in the mural. The online fundraiser for the Rivoli Park Mural Project continues through Friday, November 7th. An investment in this project is an investment in community. Check out the incentives and details here. Guess who turned 1 last week? Foundation East, a grassroots organization born right here in my own neighborhood. These action-oriented folks bring “artists, funders, and dreamers” together to turn eastside Indianapolis neighborhoods (such as mine!) into public art havens. My neighbor and friend, Rita Spalding, working on one of her signal boxes last fall. Photo by Charmaine Edwards. 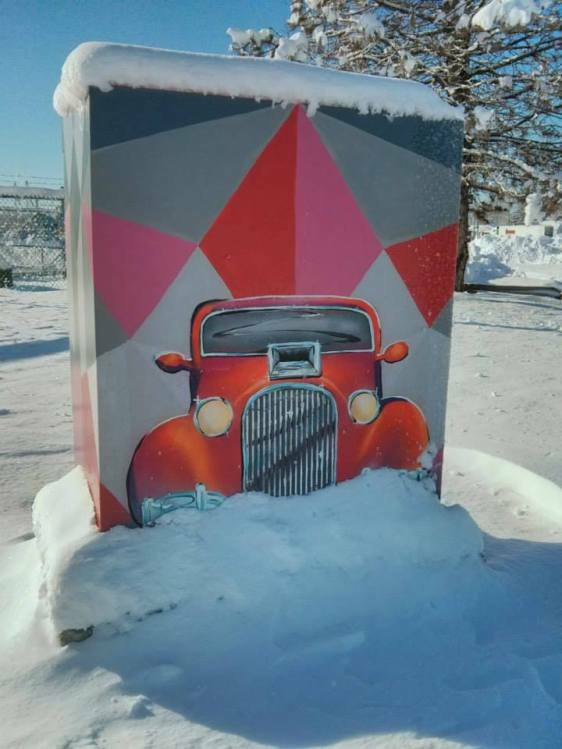 I first blogged about their work last winter in Public Art Unites the Community. Since then more traffic signal boxes have turned into canvases—not just in Irvington but in other parts of town as well. And Foundation East won a “Best of Indy” award for best public art for the Irvington project. 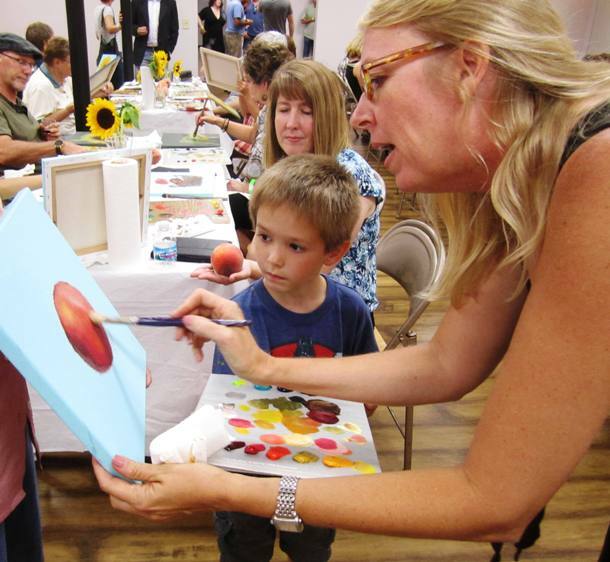 Oil painter Rita Spalding, one of the signal box artists, taught a painting class at Friday night’s birthday celebration. 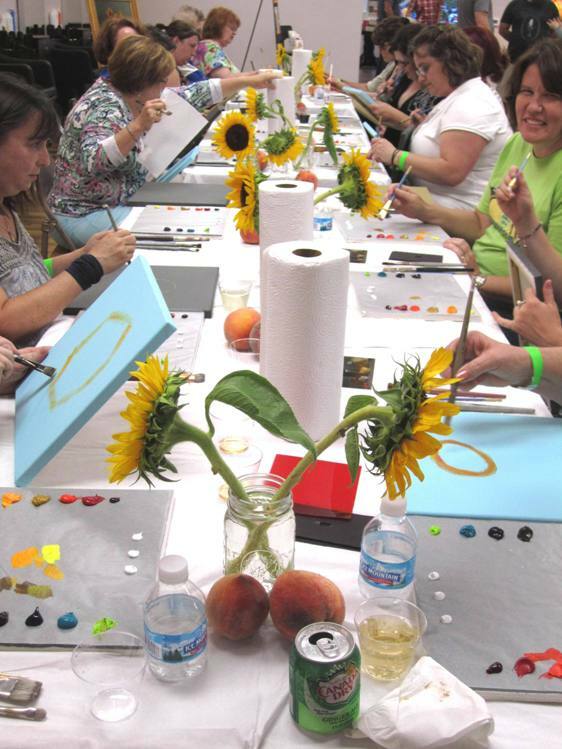 What a kick to see people so absorbed in their creativity. Not a mobile device in sight (except for the occasional smartphone photo). We need more evenings like this. Rita recently started another still life. She’s painting a signal box located on a busy intersection. Someone suggested she apply a painted wrap to the box instead, for safety’s sake. 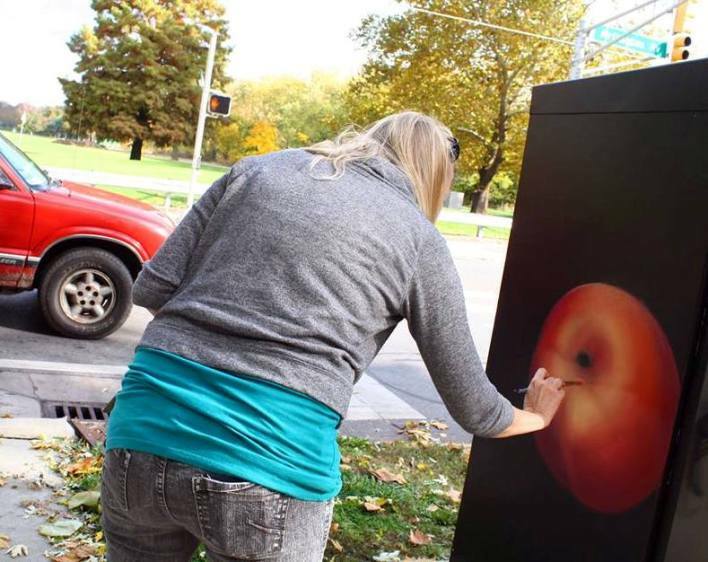 Though many neighbors have expressed concern about the cars and buses whizzing by, she remains committed to painting the box itself. Here’s Rita (what a gem!) schooling Friday evening’s youngest participant in painting a peach. Rita with Nathan, a budding painter. 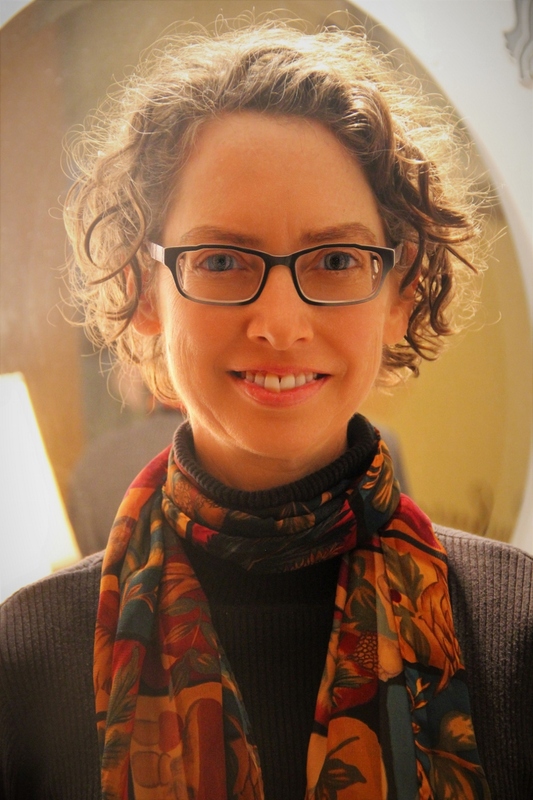 Another artist friend, Laura Hildreth, will be painting a signal box in homage to Irvington’s history. She’s the perfect person for the job, with family ties to this area going back generations. 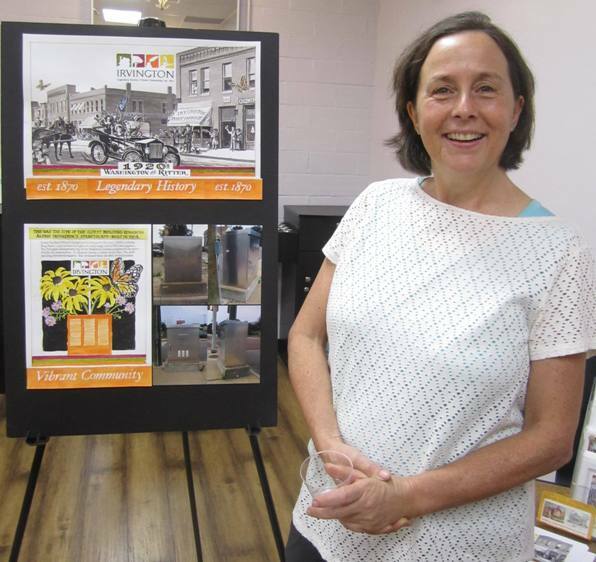 Laura with a representation of her design for the signal box at the corner of Washington and Ritter, showing the original buildings along that stretch. And just to show that we are not alone in this effort to beautify the commons, here’s a photo I snapped in Victoria, B.C. earlier this summer. 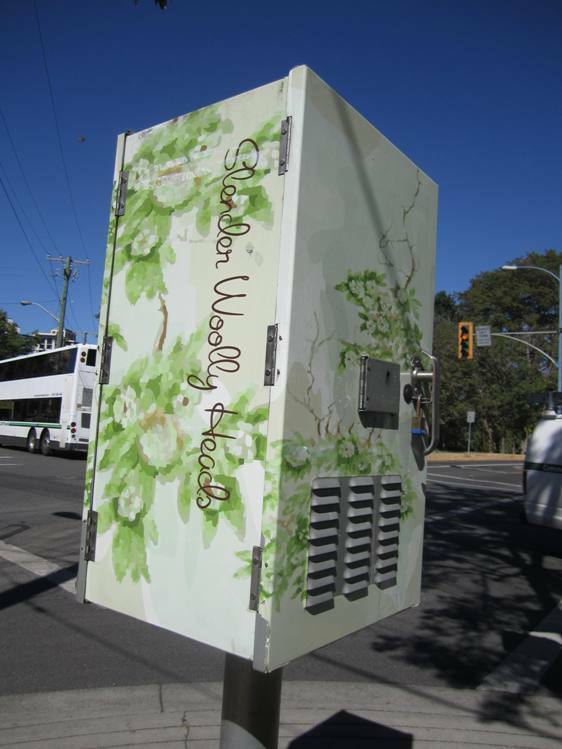 This particular utility box pays tribute to the “slender woollyhead,” a plant native to Vancouver Island. On the back was printed information about the plant. Watch for an upcoming guest post by Foundation East’s co-founder, Vishant Shah, about the next generation in public art projects. Two quotes from Indian author and activist Arundhati Roy are on my mind tonight. First the disturbing. I don’t even have to look to the horrifying news out of the Middle East to find us awash in blood. Here in my town, last week two men pulled out guns to shoot each other for the unpardonable crime of bumping each other on the sidewalk. It seems that people are less and less respectful of life, while the means to do harm are more and more lethal, efficient, and accessible. Where will it end? Yes, I hear her too. This is why I make a point, every day, to dwell in quiet. Walking the Labyrinth on World Labyrinth Day in May. Today I walked the Rivoli Park Labyrinth. I said an invocation before stepping in, and as I wound my way to the center, I imagined transformation happening. The breeze rearranging molecules, my porous body, which is really made of space and light and whirling particles. I reached the stone at the center, and just as I sat down the sun broke through the clouds. I felt it warm my back. I said, thank you. And: may it be so. As promised, here is a followup to last week’s post on the value of public art. At Foundation East’s artist meet-and-greet I met Irvington resident Holly Combs. 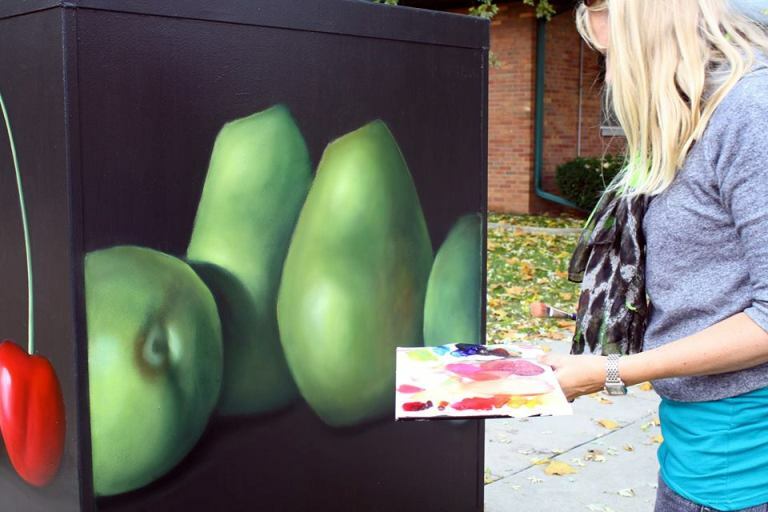 She’s half of the husband-and-wife duo who painted several traffic signal boxes around Irvington. While I was talking with her, a neighbor stopped to say that she honked and waved whenever she passed the couple working out in the cold on their boxes. Holly thanked her, saying, “Do you know what it meant to us when people honked and waved? Yeah, it was cold but we didn’t feel it. When you’re joyful in what you do, you’re not even cold.” Then she handed us each a “You are beautiful” sticker. That seems to sum up Holly, whose passion is obvious when she speaks of her various projects. For example, Street Styles. 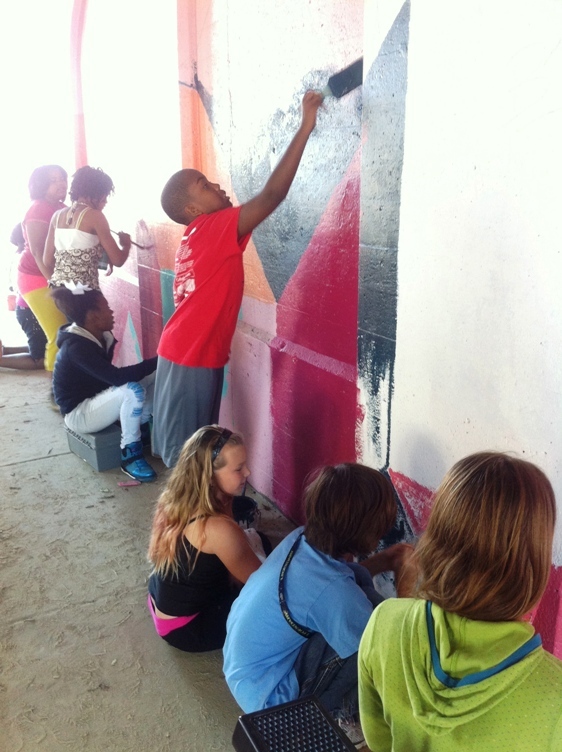 It’s a youth program she started that uses street art and graffiti as the foundation for exploring art fundamentals. With her husband Dave, she also founded the Department of Public Words. 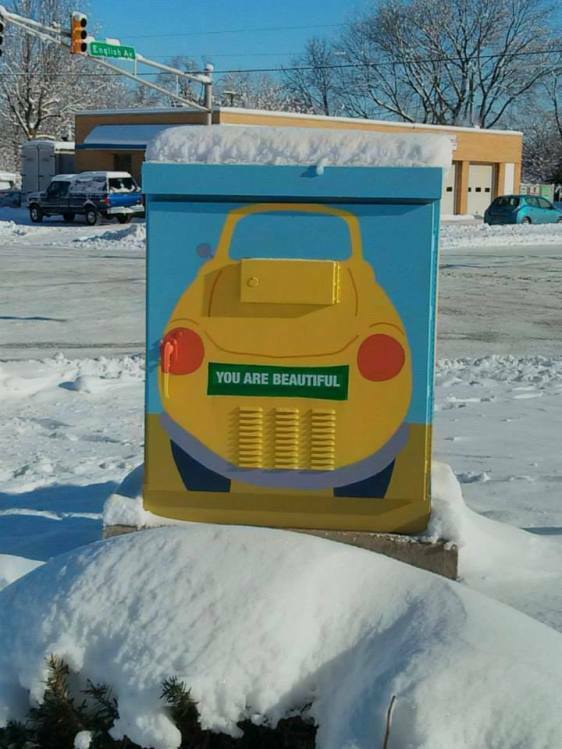 DPW’s mission is to put uplifting messages in surprising places, all to tell people “they’re awesome, beautiful, worthy, and wonderful,” as Holly puts it. They first tried it a few years back when the economy tanked and the Combs’ gallery and art magazine were hard hit. “When you lose everything, you’re fearless, thinking ‘I can do anything,’” Holly told me. She painted You Are Beautiful in block letters high on a prominent building in the Fountain Square neighborhood because it was a message she herself needed. Since then they’ve put the same message on a building on East Tenth Street. I pass it often and it never fails to make me smile. Sometimes I’ve walked my dog past the Combs’ house in summer (though I didn’t know it was theirs) to find You Are Beautiful scrawled in chalk on the sidewalk. The You Are Beautiful campaign is part of a global initiative started by Matthew Hoffman (those stickers were the first manifestation). Right now the couple are raising money to continue inspiring people with positive words all over town. With Street Styles, Holly works with youth in the juvenile justice system, many of whom have illegally painted graffiti. “I tell my juvenile offenders, ‘You go to jail for doing that and I get paid $100 an hour: who’s the boss?’” She brings the disenfranchised youth into the process of creating street art in hopes of channeling their desire for self-expression. I asked Holly how she felt about the vandalized signal boxes, since one of theirs was targeted. “Yes, our box got paint poured on it. Just out of meanness. Sad. But I see public art as a conversation with the public,” she told me in a Facebook chat. One of the Combs’ traffic signal boxes. Photo by Vishant Shah. The offenders in her program say that if a community doesn’t seem to care about a neighborhood, it’s seen as an invitation. In fact, my neighborhood started the signal box project after a police officer spoke to our Crimewatch group about Crime Prevention Through Environmental Design (CPTED). Officer Shane Foley talked about CPTED’s landscaping and lighting design principles—and how modifying the built environment can deter criminals. The group already had a history of litter cleanups and beautification efforts, and CPTED theory made a lot of sense. The traffic signal box art seemed a natural progression. Another of the Combs’ boxes. Photo by Vishant Shah. These boxes belong to the whole community, and no setback is going to slow the public art movement now. With the help of a fundraising campaign, Vishant and cofounder Aaron Story plan to have all the boxes protected with a coat of clear coat by May. Local artists, funders, and dreamers are invited to contact Foundation East about partnering on future eastside Indy public art projects. Public art is one of those things that’s more than the sum of its parts. Here in my neighborhood, the humble traffic signal box—a four-foot-tall aluminum cabinet that had never before registered on my radar—seems to be the start of something big. 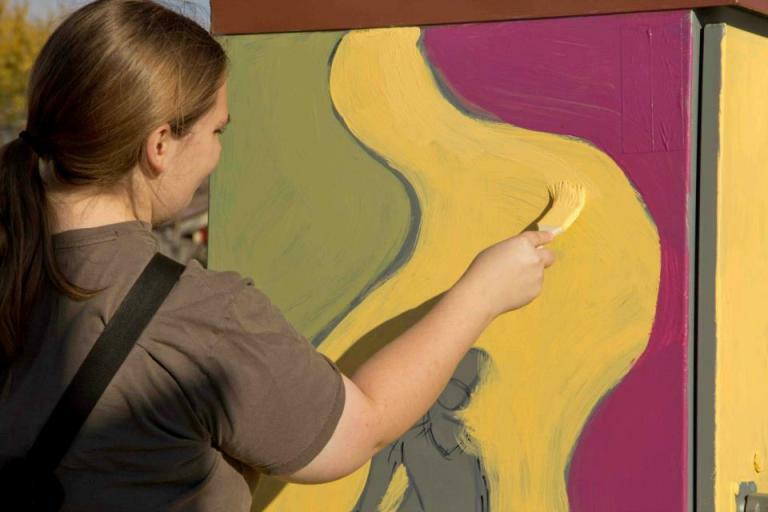 In 2012 I was one of the volunteers painting Irvington’s first seven signal boxes as part of the Great Indy Cleanup. These Colts cheerleaders helped us get the job done. Photo by Heidi Unger. Each design had been submitted by artists like Morgan Hauth, shown here putting finishing touches on one of her pieces. Morgan Hauth touching up. Photo by Heidi Unger. 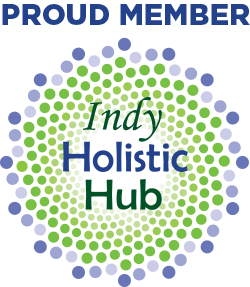 By 2013, Foundation East, the brainchild of Vishant Shah and Aaron Story, had formed with a goal of transforming eastside Indy neighborhoods through public art. Building on the success of the traffic signal box project, the duo enlisted six artists to paint another round. Oil painter Rita Spalding at work on one of her signal boxes. Photo by Charmaine Edwards. 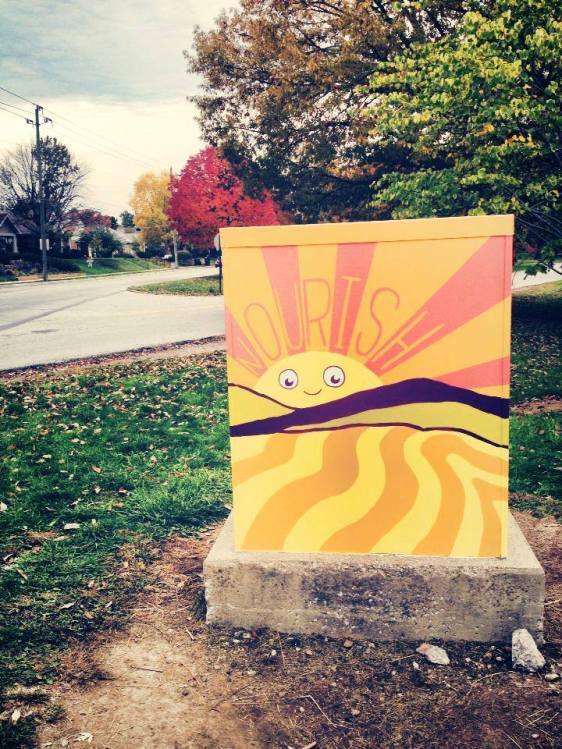 A total of 19 boxes now brighten the main thoroughfares of my community. Sadly, some disrespectful souls targeted a couple of these landmarks. 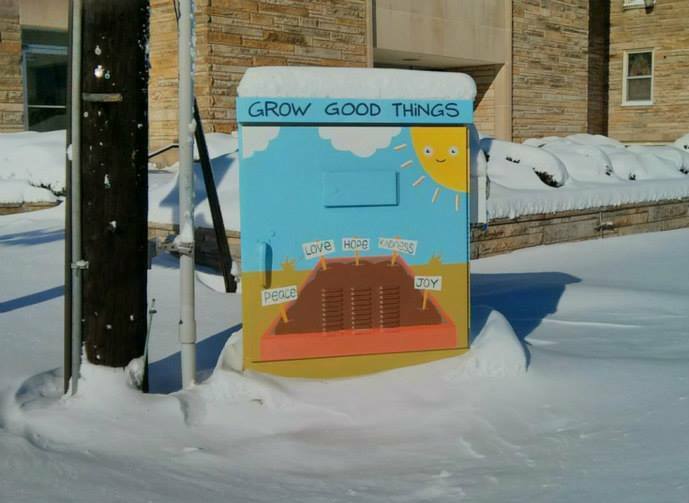 Two boxes were vandalized early Dec. 31, prompting outrage among neighbors. A third more recently had a bucket of paint splashed on it. Later that day she wiped off the graffiti. Several neighbors met her at the box to help out if needed, but it turned out to be easier than she expected, because she’d applied a layer of clear coat finish. Foundation East founders Aaron and Vishant say the outcry shows how important these boxes have become. They invited the community to meet the artists and show their support this week. 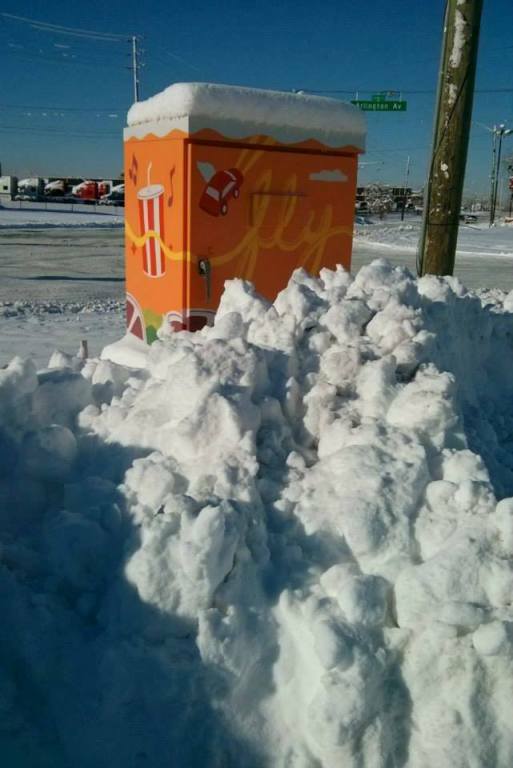 Many also chipped in for a “clear coat fund” to give all the boxes the same treatment as Rita’s. Homage to car culture, by Andrew Severns. Follow this artist at @severnscanon. Photo by Vishant Shah. I talked to several residents there who mentioned Irvington’s history as a hub of creative and intellectual stimulation, with Butler University’s campus located here until 1928. In the 1920s and 30s, a group of acclaimed painters known simply as the Irvington Group drew national attention. Erin Kelsch’s Signal box in Arctic Vortex aftermath. Photo by Vishant Shah. Dave and Holly Combs’ tribute to farm heritage. Photo by Vishant Shah. Aaron and Vishant invite local artists, funders, and dreamers to contact them about partnering on future eastside Indy public art projects. My next blog post will have more about the role of public art in placemaking, youth engagement, and crime prevention.